This stimulating and mind-clearing drink has been developed under the supervision of various scientists and nutritional experts from highly effective vegetable key substances and proved over many years. IMMUVIT CH23 is purely vegetable and entirely natural. No preservatives or coloring agents have been used in its production. 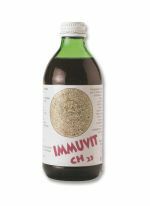 Immuvit CH23 contains special vegetable extracts from the peony, mullein, rose hip and rose mallow and has been made with specially energised water. It is this combination of vegetable substances which produces the remarkable vitalising effect. People who take IMMUVIT CH23 regularly, or take a course of it, often feel as though reborn. Most report needing less sleep, being quicker to get going in the morning and feeling as though the body has switched from pilot light to turbo. The boosting of vitality and wellbeing can be clearly felt after very little time indeed. The drink makes you more alert, fresher and quicker-witted. Your achievement potential is distinctly and durably increased. This shows itself specifically in steadily increasing concentration, ever better memory and incredibly fast reactions. Your mind becomes progressively clearer, your mental flexibility increases. You notice ever increasing physical agility such as you once had in your youth. But, above all, you are filled with an inner joy which, for the first time, makes life worth living. The fantastic properties of the mullein and peony, familiar in human medicine for hundreds of years, enhance and bolster the body’s immune system, which is, of course, the control mechanism and engine for human health and vitality. Produced under utilization of natural aromatic extracts of rose hip, rose mallow, peony and mullein. The drink do not contain any preservatives nor artificial colouring. This Product was added to our catalogue on Wednesday, 12. April 2017.